Anne Hathaway has been busy this week promoting her new film 'Serenity' and this evening(January 23rd) she attended a screening for the film at the Museum of Modern Art in New York City. 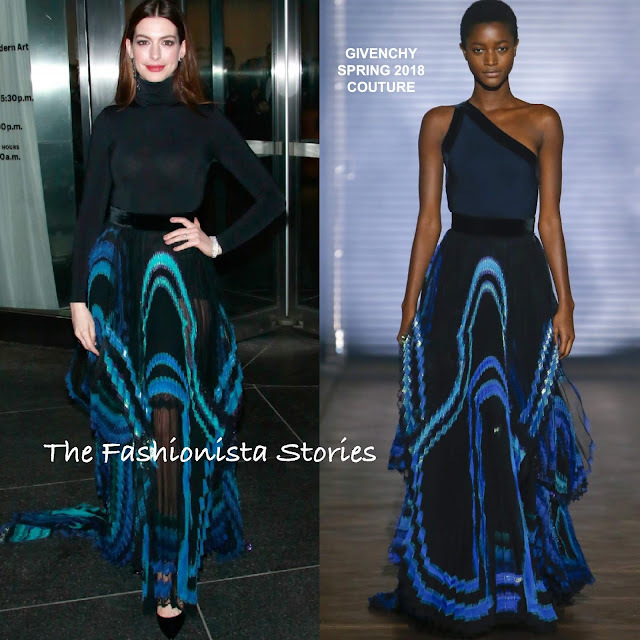 For the occasion, she turned to GIVENCHY, wearing a SPRING 2018 COUTURE sheer tonal blue, pleated, maxi length skirt, featuring a contrasting velvet waistband. On the runway, the skirt was shown with a one-shoulder, velvet trim top. However seeing as it is really cold in NYC, Anne switched the top, for a black WOLFORD turtleneck bodysuit. This may not be a wow moment but her look works nicely. Straight behind-the-ear tresses, minimal make-up and black pumps rounded out her look.